Sophisticated penthouse with the surface of 138 m2. Its distribution is composed of a living-dining room and a kitchen partially integrated by the sliding doors and a guest toilet. The exterior beauty forms the part of this great social space, thanks to the glazing system. The terrace has a surface of 30 m2, designed in form of “L” to take advantage of its unbeatable location. 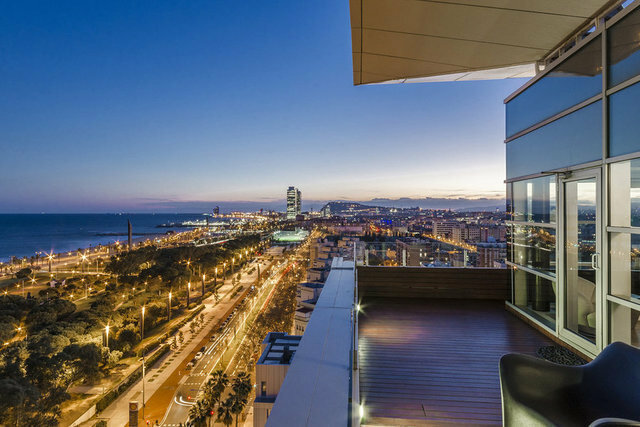 Its views are simply wonderful: panoramic where the Mediterranean Sea merges to the singular Barcelona. The night area consists of a master suit bedroom, one double bedroom and a full bathroom. High quality modern finishes and equipment. The property is in a perfect state of preservation, as it has been reformed in 2015. The building has a modern style, where discretion and elegance are the keys. It has a concierge service and 24 hours surveillance. The property dispose of the two underground parking spaces in the same building and a storage room.